ADI have always been proud of the industry leading plumbing service that we offer each of our customers. You might also hear this called jet flushing or hard flushing and is the modern way of clearing your radiators and other parts of your heating system of the dirt and sediment that builds up inside them after a few years of being in use. Power flushing can also remove limescale and even the sludge that get’s left behind in your radiators and all of this can be achieved with the radiators still mounted for example. 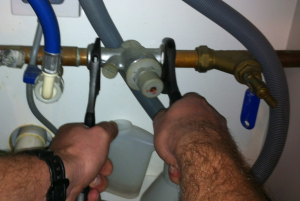 Compared to the old way of doing things power flushing is very neat and tidy. And because we work so efficiently it means that we can also offer you very good value for money for the high standard of work we do. Don’t hesitate to call us if you have any questions or queries on your plumbing issue – we look forward to speaking to you on 0800 731 3848.